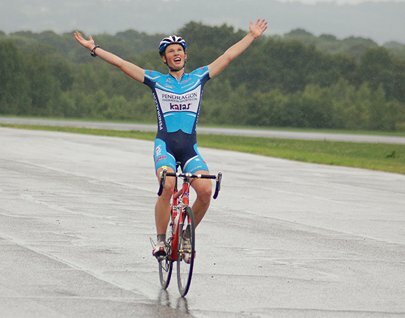 Doug Dewey (Pendragon Kalas) produced an emphatic ride to win the South West Criterium Championships that took place at Ilton, Somerset on Saturday afternoon. 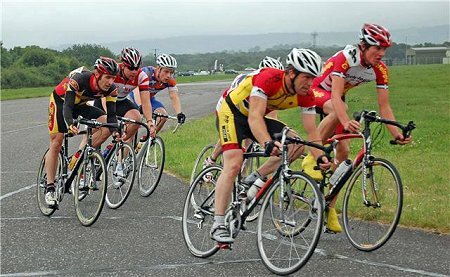 The Pendragon Kalas rider made the break on lap three of the 1 km circuit of Merryfield airbase with Greg Sandy of Somerset Road Road. 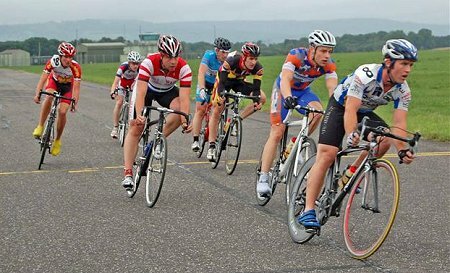 The breakaway riders worked together and gained over 30 seconds on the chasing group until on lap seven they were joined by Richard Tanguy also of Pendragon Kalas who bridged the gap while shaking off Sandy’s team mate Rob Wilcox. As the weather conditions deteriorated, the three riders built up a comfortable lead on the peloton. With the strength of Dewey and the sprint speed of Tanguy, the win was looking increasingly secure for Pendragon Kalas as the two team mates accelerated out of each corner opening up valuable meters and sapping the strength of the SRC rider, Sandy. With five laps to go, Dewey accelerated again and used his considerable time trialing ability to open up an unassailable lead to take the win. Second place was secured by Tanguy as he out sprinted Sandy in a text book display of strength and tactics by the Pendragon Kalas team mates. Pendragon Kalas rounded off a successful week with wins at both the Tor 2000 circuit series and at Liverpool by John Hollier and Dave Clarke respectively.